He could have celebrated, he could have expressed relief, he could have run over to his teammates or made a bee line to the visitors’ bench to embrace his manager. 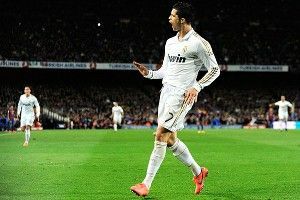 Instead, when Cristiano Ronaldo scored his 73rd-minute game-winning goal (his 42nd in 34 La Liga 2011-12 matches), he made an iconic gesture of self-worship and arrogance, aimed right at the hearts and minds of Barcelona fans. I don’t know if I’ve ever been more impressed with him. Ever since he has moved to Spain from Manchester United, Ronaldo has been cast as the Darth Vader to Lionel Messi’s Luke Skywalker. Where Messi plays within a system, Ronaldo hogs the ball. Where Messi has the floppy hair of a pre-pubescent boy and the social life of a 75-year-old woman, Ronaldo looks like Matt Dillon in The Outsiders and goes to Ibiza with models. Upon scoring the goal, GolTV commentator Ray Hudson called Ronaldo the “dark invader.” After scoring the goal, Ronaldo proved him right. How must have that felt to be a Barcelona fan, watching your side try to summon energy from their tired legs and get a must-needed three points from the La Liga leaders from Madrid, only to see this Portuguese lightning strike before your eyes? Well, you can see how they felt. They flipped him off. Thing is, Ronaldo did something with his hands, too. Hush. Calm down. Your humble footballing angel cannot save you now. Everything ends. Barcelona ends. Right here, right now. I got this. Back in your place. So many things had to go right for Real Madrid to win El Clasico on Saturday. Messi had to be carrying over some kind of footballing malaise from his trip to West London and Cristian Tello had to miss chance after chance. Sami Khedira had to be at the right place at the right time to toe-poke in an opening goal past Victor Valdes. And Madrid had to keep their nerve after Alexis Sanchez netted Barca an equalizer only one minute after being subbed on. And then Ronaldo had to cut off Javier Mascherano’s tracking run and he had to see Valdes making a stand, off his line, and he had to take one completely perfect touch and just encourage, just suggest the ball go over the line. But in the end, when you watch him celebrate — some kind of evil genius combination of assuring his own teammates, with some suppressive condescension toward the home club thrown in for good measure — only one thing really had to happen for Real to get the result they needed: Ronaldo just had to be Ronaldo.